NASA reached the halfway point on testing of the launch umbilicals for its Space Launch System (SLS) rocket and Orion spacecraft at the Launch Equipment Test Facility at the agency’s Kennedy Space Center in Florida. The Core Stage Forward Skirt Umbilical (CSFSU) underwent testing for four months. A team of engineers and technicians with the Engineering Directorate and the Ground Systems Development and Operations Program, along with support contractors, conducted the tests. The CSFSU was attached to a Vehicle Motion Simulator at the LETF and tests confirmed the CSFSU load limits, its ability to disconnect before liftoff and that it is functioning properly and ready to be installed on the mobile launcher. The CSFSU will be located at about the 180-foot level on the mobile launcher tower, above the vehicle liquid oxygen tank. During processing, the umbilical will be mated to the core stage forward skirt to provide commodities to the SLS rocket, and then disconnect and swing away before launch. Its main purpose is to provide conditioned air and gaseous nitrogen to the SLS Core Stage Forward Skirt. The umbilical was transported to the mobile launcher area in December, where it is being prepared for installation on the tower of the mobile launcher. The other umbilicals which have been tested at the LETF and are now at the mobile launcher are the Orion Service Module Umbilical, two Aft Skirt Electrical Umbilicals, two Aft Skirt Purge Umbilicals, and three of the eight Vehicle Support Posts. NASA Kennedy Space Center’s Engineering Directorate coordinated a platform beam signing event to celebrate the NASA and contractor team’s last several years of study, design, construction and installation of 20 new work platforms for NASA’s Space Launch System in the Vehicle Assembly Building (VAB). 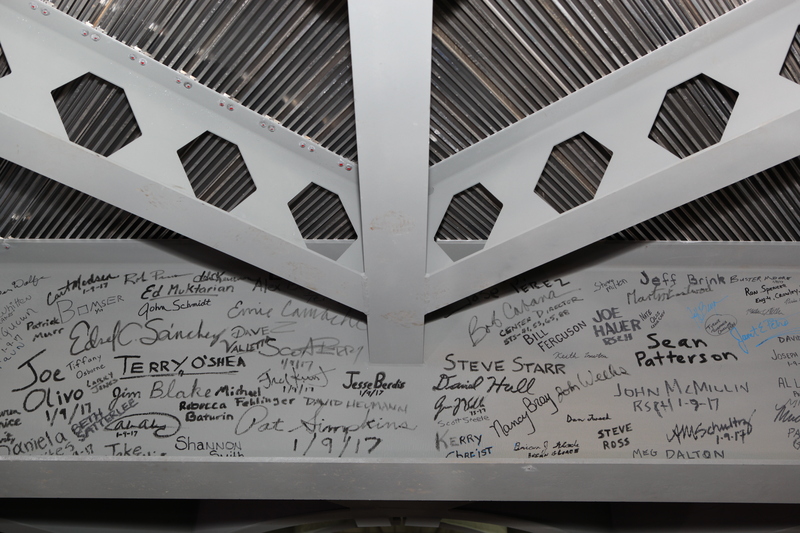 Workers involved in the High Bay 3 platform project had the opportunity to sign one of the beams of the final work platform, A North, in the transfer aisle of the VAB. 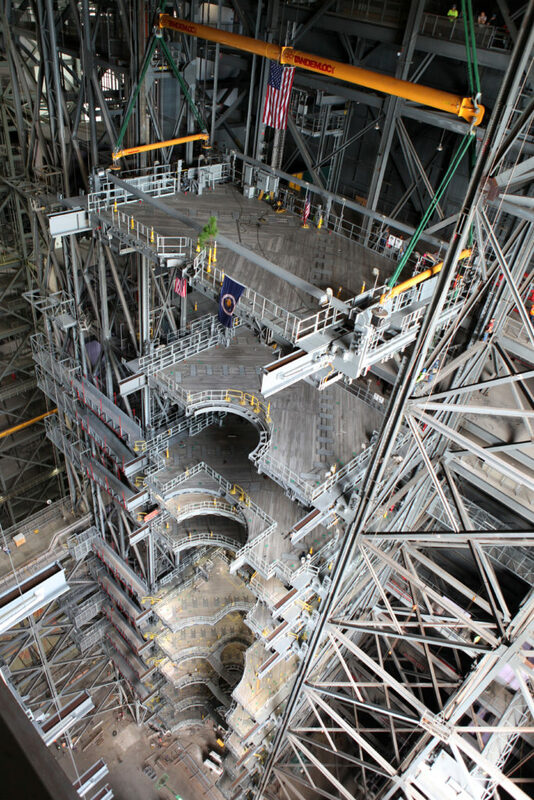 The A platforms are the topmost and final level of 10 levels of work platforms that will surround and provide access to the agency’s Space Launch System rocket and Orion spacecraft. Orion’s first uncrewed flight atop the rocket is scheduled for late 2018. 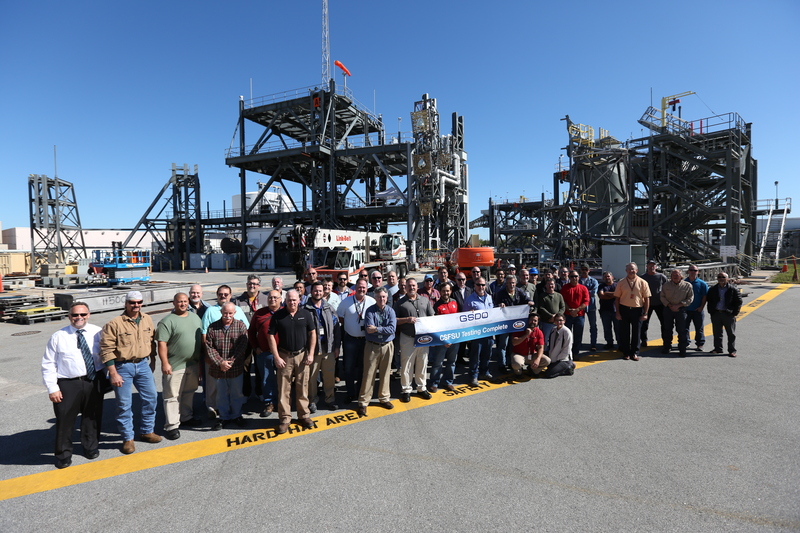 The Ground Systems Development and Operations Program, with support from the Engineering Directorate, is overseeing upgrades and modifications to the VAB, including installation and testing of the new work platforms.